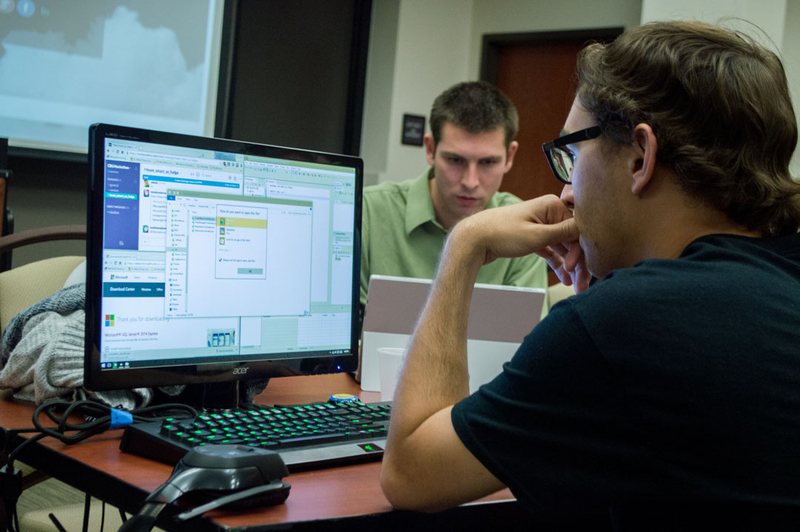 Students skilled in software engineering and design gathered together March 3-5 inside Innovators Auditorium at California Baptist University to utilize their skills in a hackathon continuously for more than 24 hours. Dr. Mikyung Han, assistant professor of computing software data sciences, organized and assisted students during the event. Han said the hackathon was different than a general coding event as it carried deeper meaning and was held so students could create apps and software he said would expand God’s kingdom. “(Intellectual property) is owned by each team so they can do whatever they decide to do, if they want to move forward they can release it in the app store and form a business if it goes successfully,” Han said. Caleb Solorio, sophomore engineering major, said he is not new to the hackathon environment and was excited to see how the app his team developed will expand the kingdom of God. The team’s app is intended to provide a mobile solution to participating at church, even after the service is over. Karina Laguitan-Rosa, sophomore electrical computer engineer and Christian studies double major, said she originally decided to join the hackathon to gain extra credit points for class, but instantly found a meaningful purpose in joining the event. Despite the long hours and countless tasks each team faced, the end result was numerous mobile apps, each capable of serving the community from a Christian worldview.